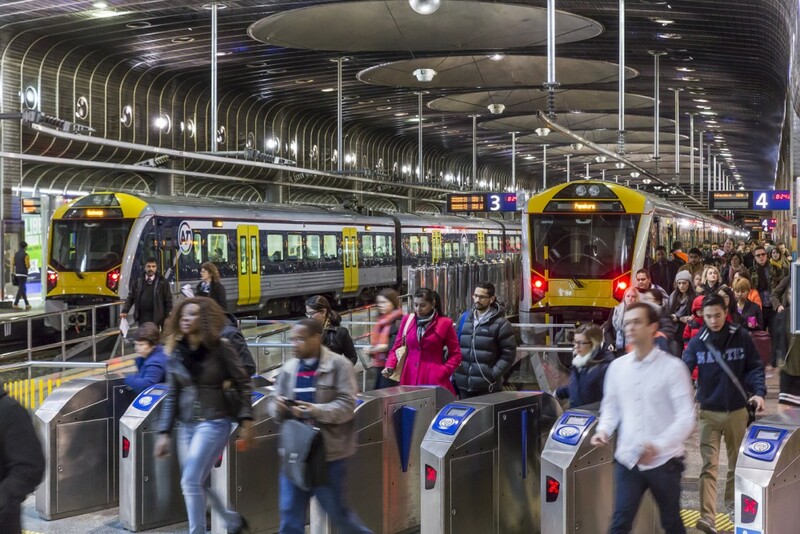 Auckland has reached another significant milestone in its public transport renaissance and in doing so has smashed the government’s old CRL targets. We’ve now reached 20 million trips on the rail network within a year, almost double what it was just four years ago. This is a fantastic achievement for a city that was once on the brink of having its rail network shut down. It also once again highlights that when Aucklanders are provided with decent public transport options that they’ll flock to use them. Even getting this far has been a remarkable feat. At one point in the early 1990’s, with ridership barely scraping above 1 million trips per year, the rail network was about to be closed down. However, the hard work and good fortune of one man set the rail renaissance in motion. You can read the full story here. Of course, things really kicked up a gear in 2003 when Britomart opened, once again returning trains back to the city. Since then usage continued to grow as services and infrastructure improved. This has been especially the case since around 2014 when the first electric trains started rolling on the network and the pace in growth has been remarkably consistent since then. This can be seen in the graph below which includes some of the big milestones over the last 15 years. The growth has been so strong it’s taken officials by surprise, to the point they’re now having to order more trains sooner than anticipated to help cope with the demand. I also believe there is still significant growth that we could see if Auckland Transport improved off peak and weekend services. Over the course of a handful of monitoring reports, the Ministry of Transport would continue to predict that we wouldn’t reach the 20 million target, assuming that growth would soon slow down. It never did. The graph below shows how many trips have been made on our rail network for the last 12-months, compared to the target set by the government. At current rates we could be at 25 million trips by 2020. It’s interesting to compare some of our predictions from a few years ago. Back in 2013 when the targets were announced, I wrote this. Over the next three years we are embarking on the biggest change to PT we have seen since ripping out the trams in the 1950s. We will have a brand new fleet of electric trains running with more capacity per train, higher frequencies on and off peak, delivering faster journeys which will all serve to make train travel more attractive. We will have a brand new bus network that among other things will help feed people into the rail network rather than competing with it and we will have integrated fares to ensure there is no financial penalty for transferring between services. These three things combined are likely to cause a massive increase in patronage in the coming years. It is due to these factors that I think it is entirely possible we will reach the 20 million trip target early. In the end it didn’t end up mattering all that much as the government came to their senses and agreed to get on with the project. Finally, it’s worth taking a quick look at the future. 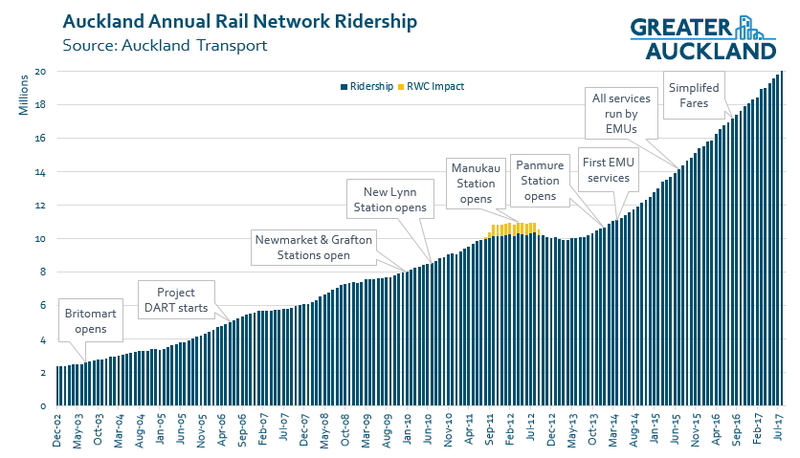 As mentioned, usage has grown so fast that Auckland Transport now need to buy more trains. These are expected to be battery powered trains so they can also serve Pukekohe. As part of the business case for these new trains, AT say their ‘best estimate’ for growth assumes 10% growth this financial year then 8% growth through to the opening of the CRL in 2023. That alone could see Auckland add another 10 million trips annually. 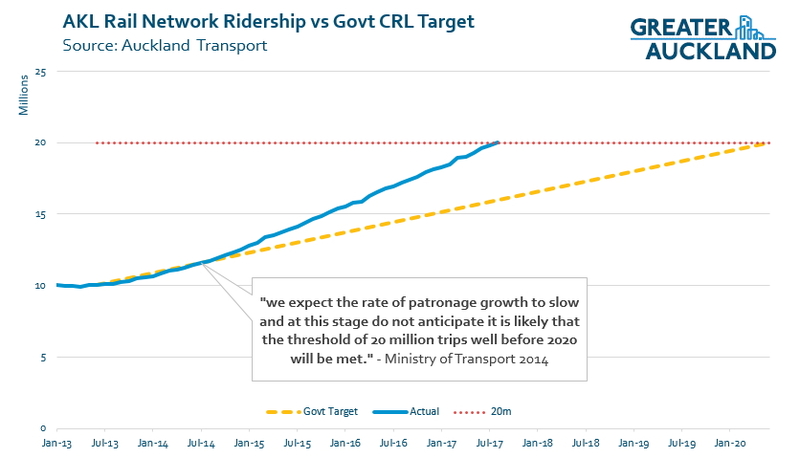 After the CRL growth is likely to go crazy again and could quickly jump to 40-50 million trips annually. All the more reason to make sure the CRL is built to maximize capacity. Agreed. 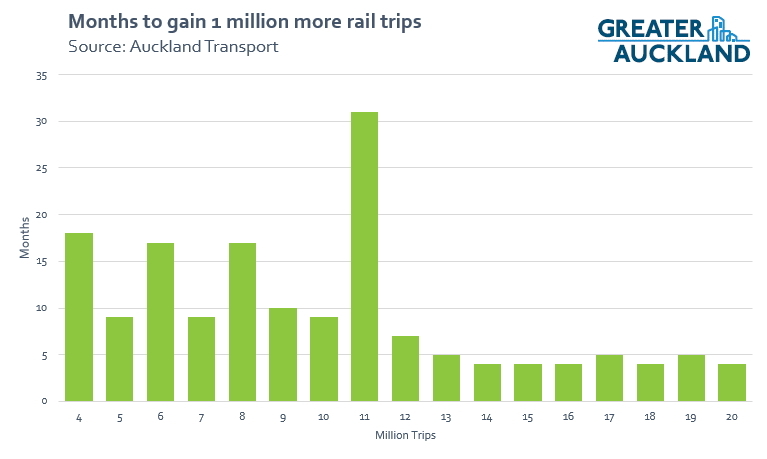 This outcome of 20m trips is fantastic, and proves that there is a real appetite for public transport in Auckland. A fully future-proofed CRL is a must. If we are going to follow modern cities like Perth we should be building at least three more train lines and dozens more stations across all of Auckland, so that access to the rail network becomes the expectation of the many rather than the privilege of the few. Can the CRL cope with this? The numbers will grow quickly – last year Perth had 83m trips on its rail network, so if our CRL isn’t future-proofed for a proper Auckland-wide network, we could be in big trouble. I agree that Auckland needs three or four more rail lines and dozens of new stations. However, it would be foolish, and financially imprudent, to design a single link to achieve that. If we did the CRL would need perhaps six tracks, stations that are three times the size,etc. That wouldn’t fit under Albert St (Aotea barely fits as it is with two tracks and a single island platform), so to demand that would make the CRL a ten billion dollar job. If we spent ten billion on it, wed have no money to build any of the connecting lines. Rather, its far better to do what they are doing: Make the CRL work for the existing rail lines, and plan new lines to run on a new link. Far more practical, realistically affordable, with better outcomes in the long run. The CRL will be nowhere near maxed-out when it opens. What will limit it is the flat junctions, particularly Westfield. If these are dealt with then 20,000 pax/hr/direction will easily be achievable. 30,000 if we go to 9-car sets. (40,000 with moving-block signalling). Couldn’t you build a flyover? The signalling system will be a constraint. Most of the network is signaled for four minute headways, i believe, which limits you to about 12,000 pax per hour per direction. You’d need a full region wide signalling upgrade and a whole lot of separations to get the 24tphpd you seem to be assuming the CRL could run on opening day. Where did you get 83 million from? The post a couple of days ago had Perth’s patronage at 60m down from a high of 65 million a few years ago. I got it from University of Western Australia and Committee for Perth report called “The Relationship between Transport, Spatial Form and Economic Growth. A comparison and analysis of Sydney, Melbourne and Perth” by Gemma Davis, written last August. It has a nice comparison table of the three cities at the end, butI hope the numbers are right! Actual numbers are available here, and broken down by line. duker – lower off peak frequencies on the Mandurah line than between Wiri and Westfield, and also no freight. Just goes to show what can be achieved with just two tracks. Yep, only have to look at tube lines and metro lines around the world to see what can be achieved with two tracks, they all have one thing in common – no freight trains and no intercity trains. Are you suggesting the third main is not needed? That also means building the second entrance to K’Rd at the same time as Mercury Lane. A second or third entrance is required with easy access. Surely the first priority is making it easy for people to get to the platforms. With escalators, lifts, underpasses and steps. A large station building is not required. Just a small office. You folks have been an important part of that rail renaissance. Hats off to you all! Thank you for all your work and lobbying. Does this mean we need to seriously look now at the platform length of the two underground CRL stations to accomodate nine car emus? Yes! People building rail tunnels should be thinking in timeframes of 50 years, not 5 years. Yes. I believe Perth plans to have 9 – car sets with its C – series trains, which are on order. They were embarking on the journey we are on now about 20 years ago. As long as I don’t have to pay for it! That would be eye wateringly expensive all to connect up with a city of 45,000. Also they would have to build the longest bridge ever built in this country which would also have to have a section on to allow for shipping traffic that goes to Portland and Whangarei proper [Duh] . Speaking of forecasting for the next 50 years, has AT – or GA – done any forecasting of the rail patronage that far into the future? Post CRL = 25m? But after that? At the present rate of rise, Auckland is on to achieve about 40million passengers in about 8 years time, and so in 50 years it could be… ummm, very large. What does the far-off future hold? I would give a very wide berth to anyone making predictions for 50 years in the future…. What a strange attitude. I think that if you’re not at least trying to see 50 years into the future, then you’re beyond stupid. This is exactly the problem that Auckland has suffered from – Mayor Robbie looked into the future 50 years, and wow – he was absolutely right. The rest of Auckland sneered at him and said he was a hopeless dreamer – and look where that has got you. There is a very big difference between forecasting for the next 50 years, and planning to shape how things will be in the next 50 years. We should be doing the latter by planning for what we want to achieve, and by constantly reviewing and updating and testing those plans…. but be very wary of anyone that claims to have calculated patronage will be in the year 2067. Guy I agree we should strategically plan for the long term; I suggested the 50 years, (which incidentally is the design life for most concrete infrastructure). However technically Nick is correct, you cannot do detailed forecasts for more than about 30 years. None of the demographers will guarantee any detailed forecast beyond 30 years, because social trends like birth rate, immigration and death rate change too much. That being said, we can adopt a long term strategy (like the congestion free network) and long term planning principles (like maximising the capacity of the core transport assets we build. So that would suggest having consistent platform lengths for running longer trains. I note AT are designing the light rail stops for 67 metre long trams, presumably for the same reason. In the first instance I expect shorter trams would be sufficient, But the longer platforms will allow them to extend the trams or couple them together for future growth. That’s exactly it Scott. In that example AT can’t be certain exactly how many people will take the train in 20 years, but they can plan to allow the option of running 67m long trains in 20 years time so that they don’t have to. Thanks Nick and Scott, helpful to have that clarified. 20,000,000 + (388 * 200,000) = 97.6 million trips. 20,000,000 + (50 * 12 * 200,000) = 140 million trips. Of course I said easy, I never said accurate. Actually if Wellington PT use is considered mature by nz standards, what would Auckland use look like if it was at the same ratio as Wellingtons current numbers on a per capita basis? That would be an interesting set of numbers to see. Although, of course, Wellington doesn’t really actually use any rail services at all. Nearly all the rail coming into Wellington is from completely separate cities: Lower Hutt, Upper Hutt, Wairarapa, Kapiti, Porirua. Plus one small solitary line up into Khandallah. Everything ends at the central Wellington Station – the actual real part of Wellington, to the south and east, is buses only as far as public transport goes. Many Wellingtonians want the much-awaited Light Rail system to start serious planning now. Only when that is implemented, will Wellington itself get a Rail system for its own citizens to use…. Guy that’s a very good point. And is one reason why Wellington based bureaucrats spent years pouring scorn on AKL’s plans;, especially the CRL; Wellington rail runs on a terminating intercity model and not an intra-city Metro system… exacerbated but the idea that Wellington has the best Transit system an NZ city could wish for, and was therefore the model. The fact the models were so off may simply suggest that the data they were working with was too far behind the land use curve. But it would be good to ask MoT and AT as to what the explanatory factors are for the divergence between model vis-a-vis a actual. I don’t know stu. If you look at their projections at the time, they effectively said that all the recent growth trends on the rail network were going to immediately and inexplicably drop right off… just as brand new fleet was about to be rolled out providing huge increases in service levels and capacity, combined with a new integrated bus feeder network shuttling thousands of new passengers to the trains, and an integrated fare structure at the same time. Effectively they said that just at the point Auckland was doing everything that has been proven to grow patronage, patronage would tank. Now that is either exceptionally poor understanding of what transit is and how it works, or more likely it was simple ideological stubbornness. Or maybe all of the above? I just recall a post from a wee way back that suggested city centre had hit its population growth targets circa 1-2 decades early. If so then thats a huge chunk of peeps that won’t be in land use forecasts used in generating these forecasts. My general preference is to assume ignorance and imperfect information as a primary factor, with ideological opposition playing a role “at the margins”. I mean the MOT would have had to have some basis for their projections no? And we know ATs projections were also undercooked, so methinks the problem is broader than just ideology. Then surely you would assume that ignorance of PT modelling and popularity would be at the forefront for this. MoT didn’t need to deliberately model to get lower numbers, they just needed to make ignorant/incorrect assumptions that incidentally lowered patronage projections. The population growth might explain why we hit the target now rather than say December but I doubt it explains much of MoTs forecast. Stu I have very little sympathy with MoT people on this. They were either tugging their forlocks and giving their masters the answer they thought they wanted to hear, or they’re entirely incompetent, stuck in Wellington and unable to understand another city. Either way the damage to their individual and institutional reputations should be high. They are supposed to be expert, that have access to data people like us don’t (who called it right), they are paid to think about this stuff. It wasn’t even a case of them whacking out a lazy extrapolation, which is common in the field, they actually called a discontinuity, but in the entirely wrong direction! Stu, my understanding is the 20m target was not anything too technical but a doubling of ridership at the time (a touch over 10m), which was something they assumed was unachievable based on the growth at the time. Lastly it’s notable that the person who came up with the target is the same person who was previously tasked with rubbishing the earlier CRL business cases. This included changing the model inputs to things like saying parking prices in CBD won’t increase for decades. Stu, do you suppose that recent immigrants and returning expats are more likely to catch the trains than ‘kiwis’, considering they often come from countries where public transport networks are more developed and usage is higher. I would be surprised if the forecasting allows for the fact that Immigrants are more than just units, they bring in different attitudes and behaviours and this may contribute to the discrepancy. Would be interesting to know if this has been studied. ive often wondered if immigration will result in a reduced appetite for rugby given its a marginal sport in most of the world. Yes I think this is a factor. To be honest, I’m a little surprised that the fare simplification isn’t showing any impact in the graph. To me, it looks as if the growth trend was unchanged. I wonder if the impact is simply being hidden by the granularity of the graph, if the lag between introduction and adoption is more than 6 months, or if as I suspect, AT has again done a poor job of informing the public. I’m sure I’m not alone in considering AT to be bad at getting messages to the public – They need to be more proactive at educating the public about things like the fare simplification and more importantly, what that means for all public transport users. They need to crow about how popular PT is in Auckland, so the naysayers can’t blindly say that nobody uses PT here. It wouldn’t hurt if there was clearer information about what events have free PT with your ticket. 1) the benefits will be realized slowly over time and 2) they will be amplified by the new network and 3) they will be hard to disentangle from everything else. Put another way: akls current pt services dont operate as a network. Hence integration will start to have a larger effect once NN is implemented. To see the benefits of fare integration supporting other changes you just have to look at the success of the otahuhu interchange. I don’t think it would have been so successful without IF. Agree, integrated fares and intergrated network are just two sides of the same coin and probably impossible to separate. Stu do note the New Network is now operational in the south and the west, the areas that benefit the most from rail intergration. So we should already be seeing the impacts of that starting to come through. I wouldn’t be surprised if the the growth rate increases even further about now, for a while at least. Better off peak train frequencies should help the new network work properly. People ain’t gonna transfer if they have to wait 30 mins. Yeah i know new network is now operating in south and west :). My reply was in relation to the effects not being realized just after IF was implemented, which is how i interpreted original comment. I’d expect that entaglement would be a very big factor in truly seeing what’s going on. Regardless of my curiosity – Good numbers to see. Would love to see the numbers trumpeted from the parapets. Still too many nay sayers to convert. The amazingly consistent growth suggests it is down to a accumulation of effects. I would suggest that the idea that big changes often have less impact in short term than might be expected but more in the longer term is at play here. The big question I guess then is how much more growth is backed into the pie already? Big structural shifts like City Centre residential population and employment growth suggest it may continue to be high. And yes off peak rail services must improve to support the New Network. 10 min all day frequencies are a must. Between the new network, integrated fares, electric trains, improved service, the CRL, and changing land use you would have to think that at least 50m trips are baked in, surely? What balance of better pay, working conditions and job prospects is the lure? Are drivers being mucked around here or is it just disheartening to work in an undervalued sector? Here’s an easy fix for that problem. Longer trains is also another method to increase productivity. I agree improving off peak and weekend services from 30 minutes to 10 – 15 minutes would increase patronage numbers very significantly across the whole train network. Wish they could somehow improve the current 30 minute Onehunga frequency? Are there any viable options available for AT to do this? While the junction at Mt Eden is being built for CRL we will likely see a reduction in Western line services running through Newmarket and Britomart. Hopefully AT see this as an opportunity to increase Onehunga services to every 20 mins with the extra space available at these spots. Unfortunately, higher frequency off peak and faster journey have not eventuated. Pretty lame arguments that they’ve put forth, no? I especially love the last one, 17M until the CRL – That’s truly gold! Why are they only allowing 8% so soon when the Eastern & Central New Network comes on board Dec 2017 & around 2nd qtr 2018 respectively. Wouldn’t it take a while for uptake due to that change. Then we have first stage of AMETI Panmure to Pakuranga busway around 2021, greatly adding to the transfers that would occur at Panmure. +1, 8% in 2019 would still be almost 2m trips a year added! Good point, but 8% may still be under considering population change/shift to Auckland. How much will come about from mode shift due to the increased reliability & improvements we have & will see? Cycling improvements will further add to it. Some people may still be recovering from bad mixed fleet experiences…..then again as the trains get crowded, it will naturally stifle that growth, unless they can improve capacity ahead of that. The Pukekohe line is unlikely to be electrified within seven years (when batteries will need replacement). We should buy the battery trains and convert them to standard running when the batteries expire in 2024, or replace the batteries and extend service to Pokeno when the electrification is complete. Yes I understand that, as I said no cities are identical, in AKL we are doing some things they didn’t in Perth too, and I have not claimed that we will add 16mil riders in two years, but that our changes will mean we will comfortably beat 10% pa.
And seven years to add 10million? Certainly will happen, and more and more quickly if AT are able to smartly integrate fares, quickly build good interchange stations, and run both trains and buses to ‘turn up and go’ frequencies. All going to plan 2017 should see the system bursting at the seems, and that’s conservative. Go for it, Patrick. 🙂 Your modelling was superior because it wasn’t “politics by another name”. Where’s the difference between calling a PT ridership discontinuity without any rationale, and retaining debunked traffic and land-use models to claim economic benefits for roads? Both errors serve the same political purpose. I have a question has AT broken down the ridership for weekends ?. As sometimes when I have travelled on the trains on the weekends there seems to a large number of family groups going out for day trips or out of towners going for their 1st auckland rail journeys . It good be interesting to know . In the board reports AT give the figure for the average weekday ridership over the year. The last we saw was April or May and at that time was about 66k per weekday. That works out that weekend use is about 21k per day. Generally around 86% of trips occur on a weekday. I realise you guys have a lot on, but a post showing this and any trends over the last few years would be really interesting. 7 years is far away, nicer would be Americas Cup race time or before CRL opens. And no way converting BEMUs to plain EMUs. The replacement batteries should be not far from the $400k each battery cells cost so renewing will give AT the ability to reach the metro network further. With growing passenger numbers then the next EMU tranche may need ordering just after the BEMUs are delivered. A quick start to implementing Regional Rapid Rail will build nicely on these patronage results. And from a selfish point of view a rail loop through Paeroa and Te Aroha would be great. I always maintained trains are biggest movers of public. More roads and more buses needs to end. One large investment in rail system and it will suffice for many years to come. Look at the world. Main transport in majority of countries is rail system not buses. At 22 million to reopen the Onehunga train line and 1.4 million trips is a major ROI. Think of all the car trips that has saved. Would be interesting to see if the bus numbers had been effected or stayed the same. If the same and with very simplistic analysis – 220 working days is 3000 commuters per day. At 60mins drive average per day, that is 180k less hours in cars per day.